Road changes near the T2/T3 Domestic precinct were implemented on Saturday, 14 October to help you move in and around the airport. The works form part of a joint investment by Sydney Airport and the NSW Government. 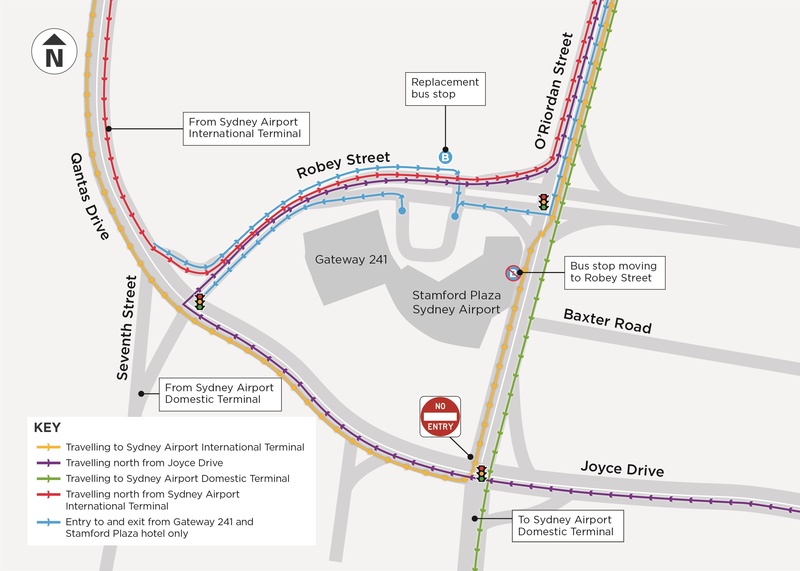 They will see the opening of a widened section of Qantas Drive between the main entrance and exit to the T2/T3 precinct. At the same time, lower Robey Street will become one-way northbound for traffic travelling between Qantas Drive and O’Riordan Street, and O’Riordan Street will become one-way southbound for traffic south of Robey Street. All road signs have been updated to reflect the changes, and electronic message signs will be displayed when the changes are new, to help you find your way. For the latest traffic updates, you can call 132 701, visit livetraffic.com, download the Live Traffic NSW App or follow @LiveTrafficSyd on Twitter.